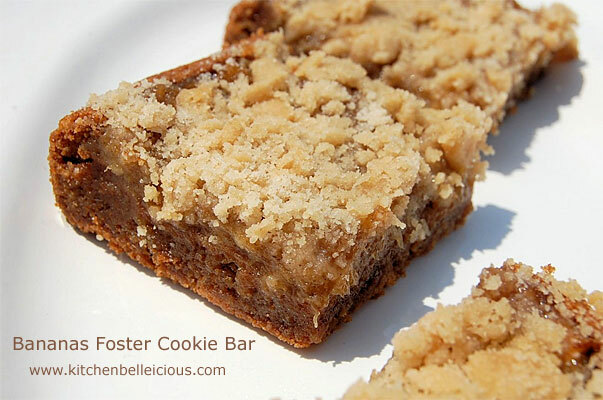 After having had Bananas Foster on her first date with her now husband, Jessica developed these bars as a reminder of how it all began. In a large bowl mix together the butter and sugar and add the egg and vanilla. Pour all but ¼ of the batter evenly into a greased 9 inch square pan. Bake at 350F for 20 minutes. Meanwhile let’s make the banana layer for the bars. Over low heat, melt butter, sugar and cinnamon stirring until almost dissolved. Add in the bananas and sauté for another 3-5 minutes until all the sugar has been dissolved. Mash the bananas with a potato masher and spread evenly over the cooled cookie bars. Top with the remaining dough by crumbling it over the banana filling. Bake at 350F for an additional 10 minutes until the top is nice and slightly golden brown. Cover and refrigerate for at least 1 day before cutting into 2 inch squares.